The third floor master bedroom's balcony. Each floor of this home features its own private balcony. 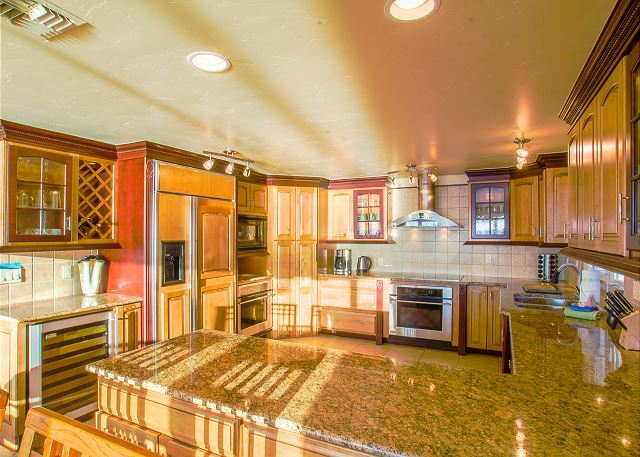 The main floor balcony leads to the barbecue area and Jacuzzi. The barbecue area, Jacuzzi, fire pit, and stairway down to private beach are located on the northwest corner of the home. The balcony of the main floor that leads to the fire pit, Jacuzzi, barbecue and stairway to private beach. The paved driveway leading to the main house, covered parking, and garage. Plenty of parking spaces available. Looking up to the hideaway at sunset from the small private beach. A view of the private beach at sunset. 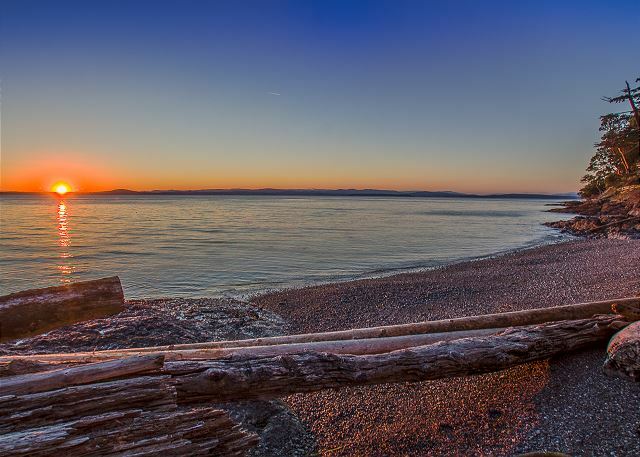 Vancouver Island Canada in the distance. The paved driveway leading to the main house, covered parking, and garage. A baby orca, J-52, breaches right in front of the house. This is the main entrance hallway on the main floor (second floor). Master bedroom is upstairs and home theater is downstairs. Two guest bedrooms are seen on the left and the right. Main floor (second floor) living room (fireplace is not for guest use). Main floor (second floor) living area and dining area. Main kitchen (second floor) on the main floor. Main kitchen on the main floor (second floor). The main floor's (second floor) dining area and doorway to private balcony leading to the Jacuzzi, barbecue and fire pit area. 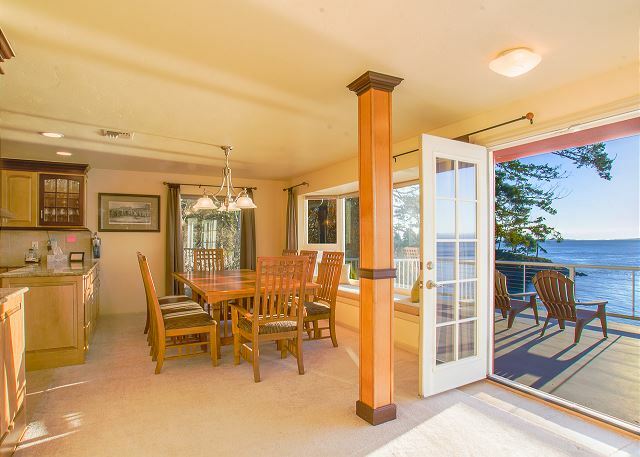 The first floor (downstairs) dining area shown here at sunset with commanding views over the streets of Juan de Fuca. The main floor guest bedroom on the southwest corner of the home features one full-size bed, dual nightstands, dresser, private side entrance, and closet. 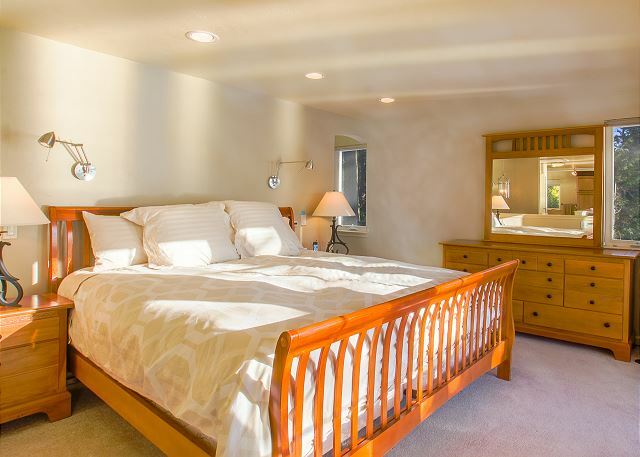 The main floor guest bedroom on the southeast corner of the home features one full-size bed and one daybed sofa. 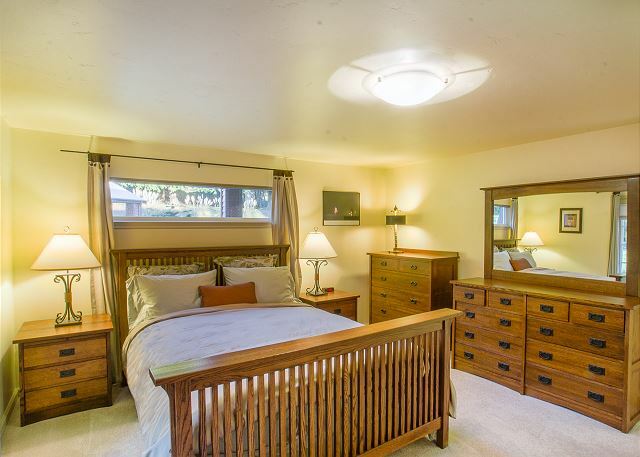 Also features private entrance, dresser, dual nightstands, and closet. The full bathroom located on the first floor. 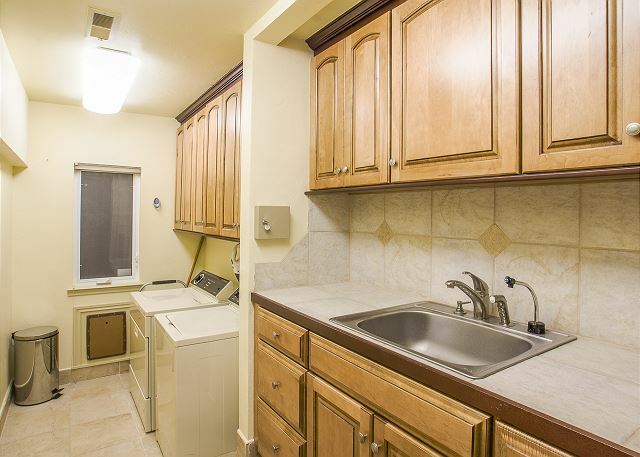 Also located in this bathroom is a full-size washing machine and dryer. The laundry room located on the main floor. The kitchen located on the first floor (downstairs). The first floor (downstairs) features a media room, kitchen, dining table, full bathroom and shower, washer and dryer, private balcony with stairway access to Jacuzzi and barbecue area. The third floor (upstairs) master bedroom's king-size bed with two nightstands and overhead reading lights. 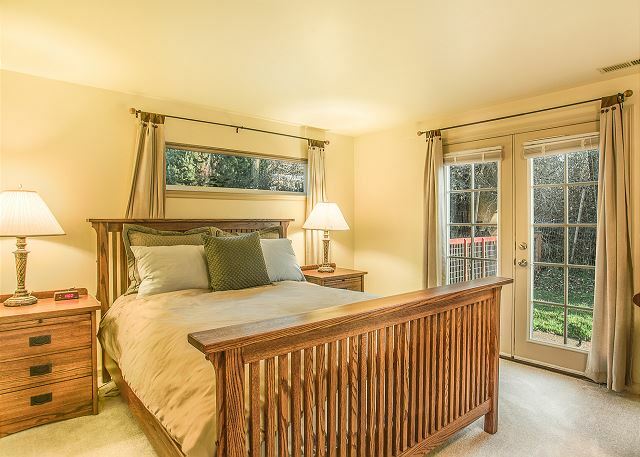 The main floor guest bedroom on the southeast corner of the home features one full-size bed and one daybed couch. 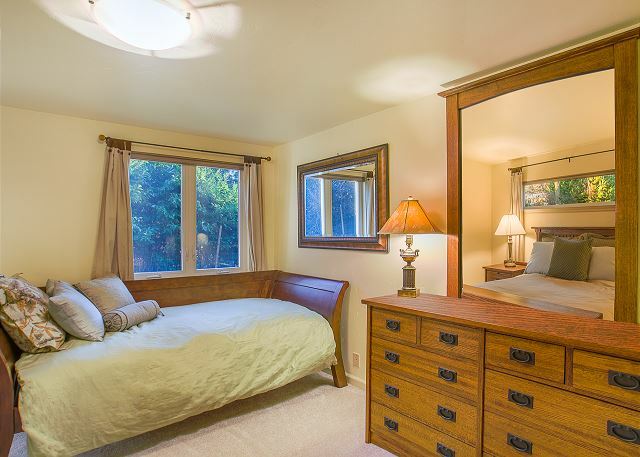 Also features private entrance, dresser, dual nightstands, and closet. Third floor (upstairs) master bedroom soaking tub and basins. The main floor bathroom is shared. The third floor (upstairs) master bedrooms living area with electric fireplace, open to his and her sinks and glass door shower. 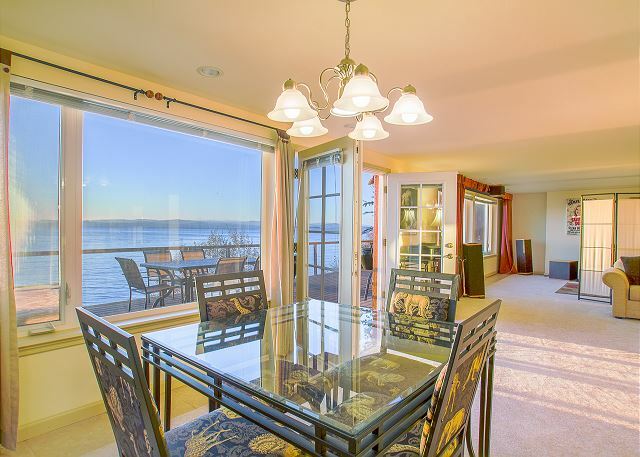 Spectacular views to the water! 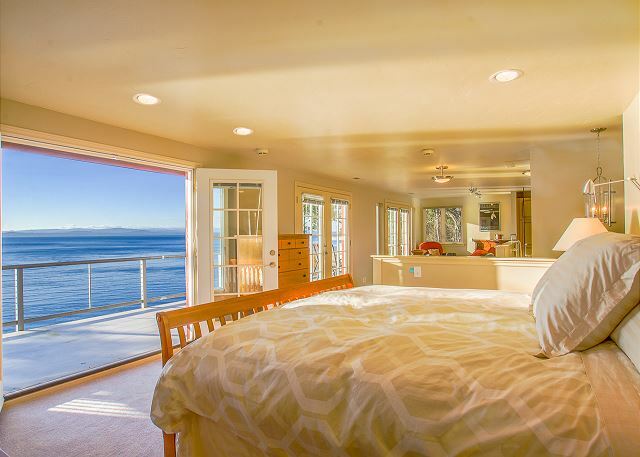 The master bedrooms living area with commanding views over the Straits of Juan de Fuca to the West. Whale Watch Beach Retreat - Amazing Private Beach! 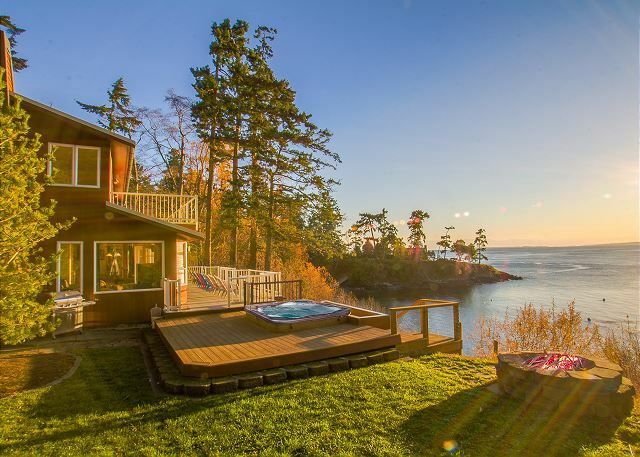 Enjoy the sweeping view of Haro Strait with Vancouver Island in the back drop from the outdoor hot tub or either of the expansive three decks. 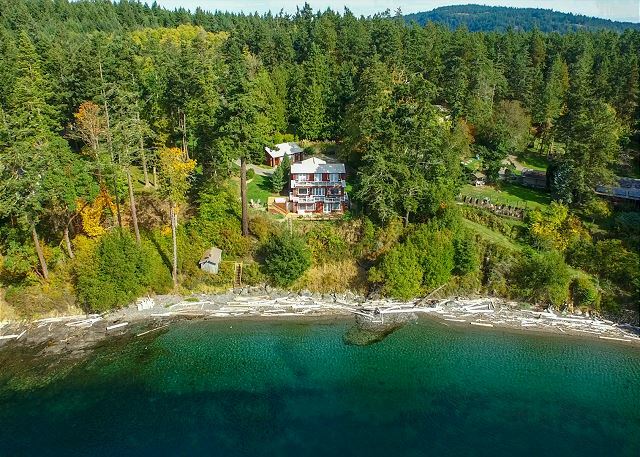 This is a great property to watch the whales go by or to launch your own private kayak. This property is nothing short of perfect. With its private beach, spacious grassy yard and media room you will not run out of activities here. The gourmet kitchen is fully equipped and adjoins the dining area so your guests can join you while preparing a delicious meal. The master bedroom encompasses the whole 3rd floor and has its own seating area with electric fireplace. 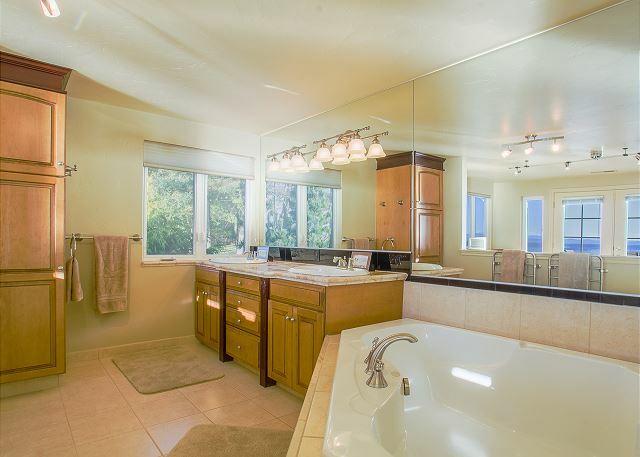 The master bathroom is open to the bedroom so you can still enjoy the expansive view. The other two bedrooms are located on the main floor on either side of the entry hallway and share a bath also located in that hallway. One of the bedrooms also has a cozy daybed. 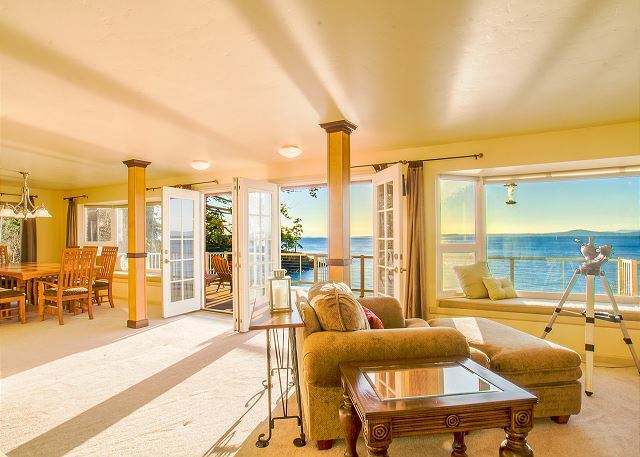 Toward the water side of the house is another lounging area with very comfy seating and stunning views of Haro Strait and Vancouver Island. Downstairs boasts a cedar wine cellar (Bring Your Own Wine) with a hip tasting-table that seats two. The media room has a large flatscreen TV for the Satellite TV or to watch one of the many Blueray DVD’s that are provided. 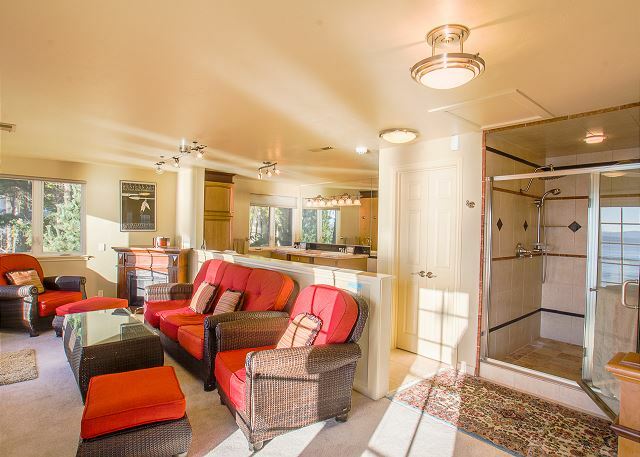 This media room also has a fold-out couch, kitchen and a private bathroom with walk-in shower. 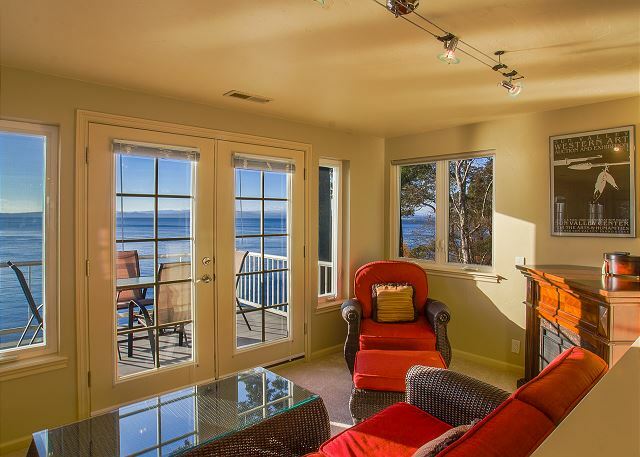 Wireless internet is available throughout the house and all of the levels have outside seating on the deck to enjoy the beautiful sunset here on San Juan Island's west side. Book quickly, this one will fill up fast! This house has NO cell phone reception. We loved spending Christmas in this beautiful home. We cooked (two kitchens was so helpful), played games, watched movies and enjoyed long walks. The house had everything we needed and the layout made it very comfortable for everyone. 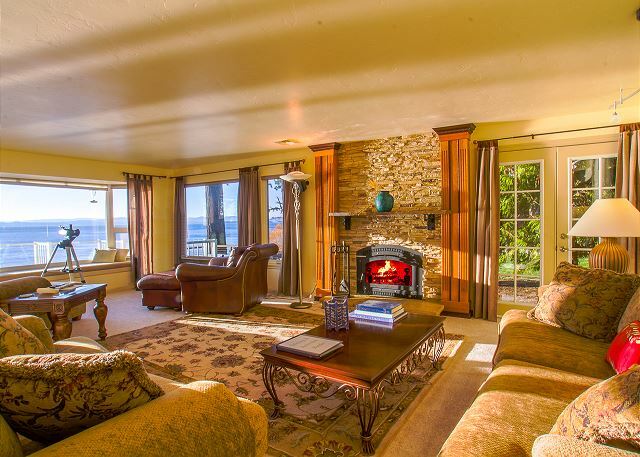 It sounds like you had a lovely family Christmas at Whale Watch Beach Retreat. We are so happy the house was so well suited to your family's needs. Thanks again for choosing San Juan Property Management, and we hope to host another family gathering for you! This was our second visit. Beautiful home! From the moment you drive through the gate, you know you’ve entered paradise. Private, quiet. We couldn’t ask for a more perfect respite from the hectic Seattle life. We love to host returning guests! 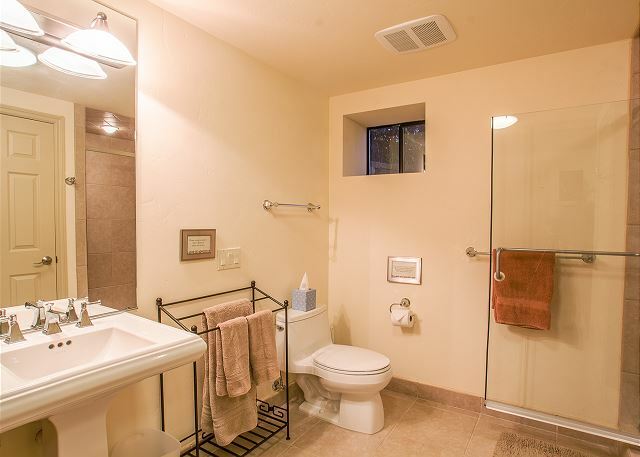 We are so happy this home provides such a restful time for your San Juan vacation. 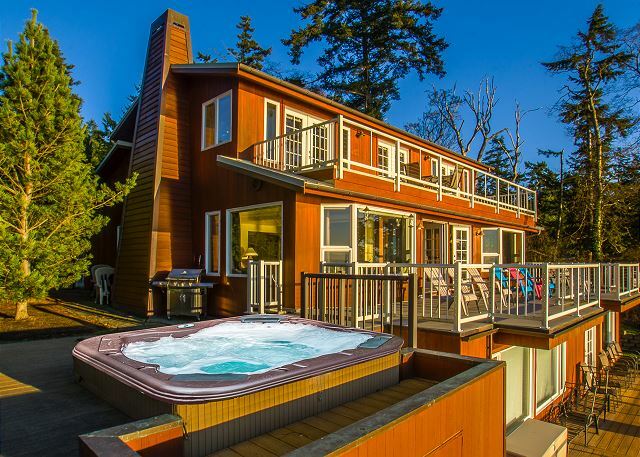 Whale Watch Beach Retreat really provides a wonderful waterfront experience, and the hot tub doesn't hurt either. We hope to host you again! 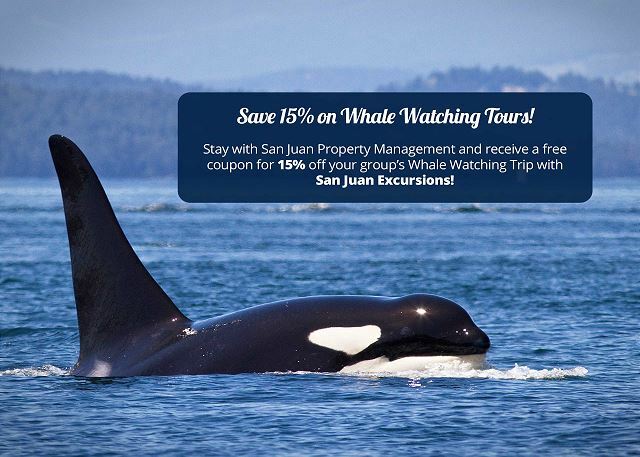 We have stayed at the Whale Watch Beach Retreat several times and have thoroughly enjoyed staying there every time including this latest stay of 2 weeks. We absolutely loved the home, it's location, and all of the amenities. This house did not disappoint. The view was stunning and we were lucky enough to see the orcas from the deck on the Tuesday evening of our stay in late July. It was truly a magical experience. This was the perfect home for our family of 5. We stayed for 5 nights. Views from decks were gorgeous. Saw orcas several times each day. Loved sleeping with windows open hearing waves crashing on beach below. Plenty of privacy for all 5 of us-teenage boys could sleep downstairs in basement until noon while the rest of us got on with our lives. Kitchen well stocked. Grill worked great. Beds very comfortable. . Hot tub worked great. Couldn't ask for a better home! 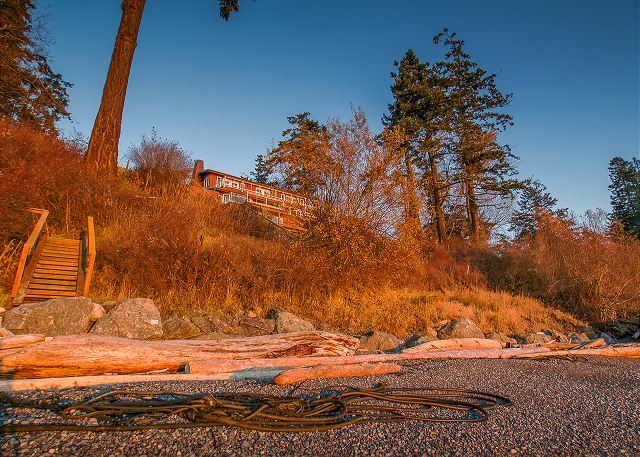 This was the best place we have been to on San Juan Island. The house and the surrounding landscape are beautiful. The best part was the three decks. While my family was off exploring the island or going to Sydney, BC I basically sat out on the main deck. I saw so much wildlife, both on land and in the water. I hated to leave. We've stayed at this property several times before and had another great experience this time. What a wonderful house! Just driving into the gate made us instantly happy. The property is off the beaten path in a lovely part of the island. 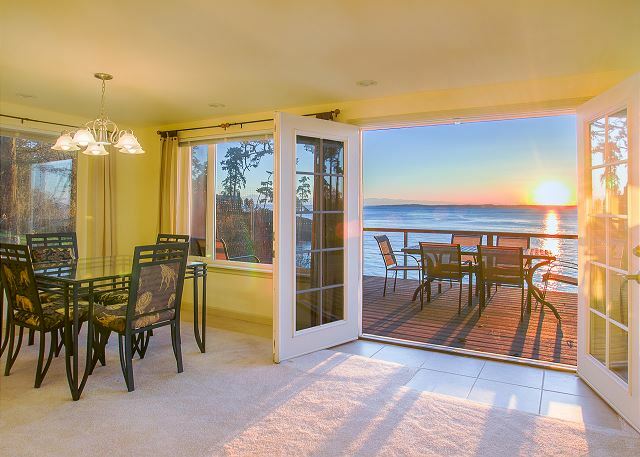 Fantastic views and great access to a private beach! The property is gorgeous with a great lawn and deck on the whole back of the house. An evening with a fire and sitting in the hot tub can't be beat! Inside is clean, well maintained and modernized. The kitchen and bathrooms are fully equipped. Comfortable bedrooms. I would stay here again in a heartbeat. We loved the house and location. Perfect weather every day. Unfortunately we only saw 2 whales in 4 days. It would be nice to top that scrubby tree on the beach as it is impeding the view, it would be nice to have games and cards at the house (only monopoly). There was a deer in the yard much of the time, grounds beautiful. San Juan mgmt responded right away when we were short of supplies. House very spacious with quality furnishings. Very enjoyable time! we loved the house, being able to get our kayaks in the water, and watching the sunsets every night. thanks for keeping an impeccably clean vacation retreat. the neighbors were wonderful too. This vacation rental was everything we dreamed of. 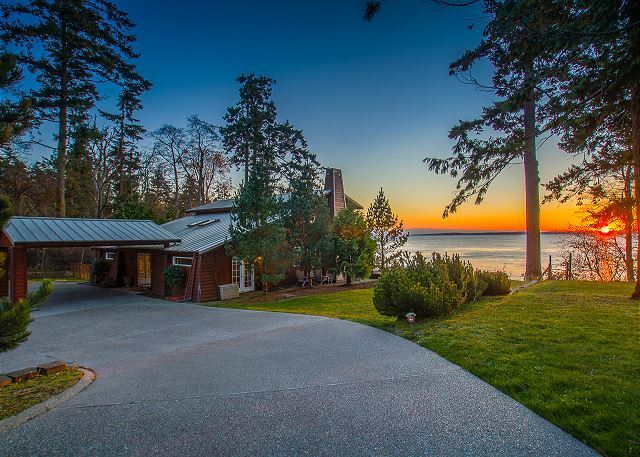 We were taking a sisters trip with 4 of us and we picked this house for the location and hoping to see Orcas. 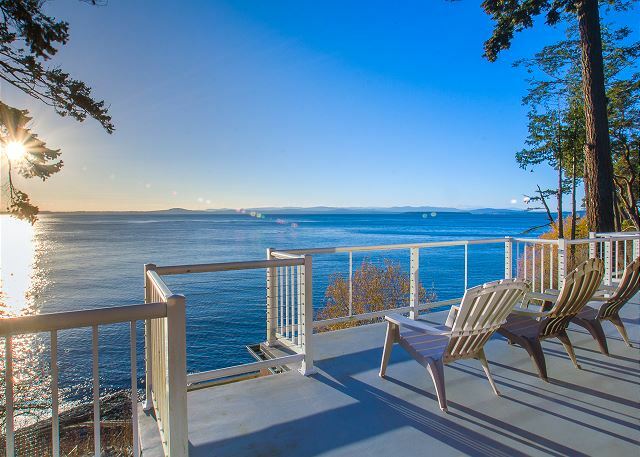 We cannot say enough about the stunning views and we were able to see Orcas and other whales along with other wildlife off the deck of this beautiful home. The home is very large which was nice to have our separate areas to relax. The private beach was also a nice treat since you felt very secluded. We also kayaked, biked and took out a whale watching boat. We enjoyed seeing the Orcas from the kayaks, so we felt really luck to have seen so many whales during our visit. 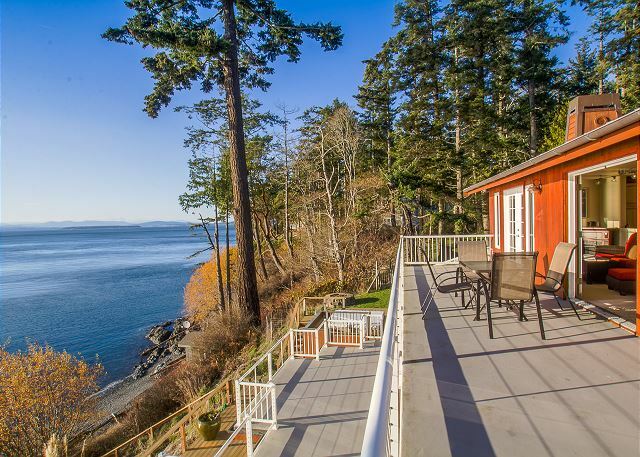 We definitely hope to return to San Juan Island and if we do, we plan to book this home. We had a wonderful time even though the orca whales were only on the west side of the island for a day -- but we saw them from the house and Eagle cove. Marvelous weather + a great retreat home = perfect vacation. Saw eagles, sea otters and seals daily from the deck. This was our 3rd time visiting San Juan island, and it will go down as my favorite. The home is amazing. Perfect for hosting our group from around the Northwest. The weather was a little rough over the weekend, so the open spaces, large kitchen and dining areas were perfect for our group. Not to mention the great view, and hot tub (perfect for all weather). I would definitely stay here again! 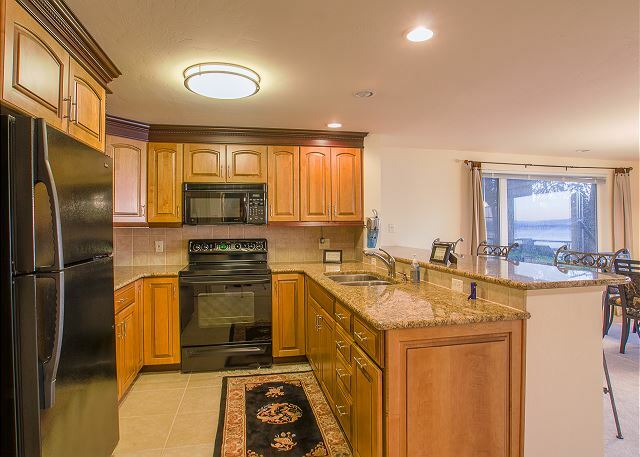 Everything about this home was as it was described in the listing, and so close to great areas on the island. had a great time at whale watch retreat. saw humpback whales from deck, and orcas and seals, and otters. property is well kept. house is well appointed and comfortable. televisions need updating. 4 TV's in the house, and the only one that had satellite was on the lower level. the others played dvd or vhs (really, who has vhs anymore? )also, fireplace was not for guest use. and the snaps in the carpet need to go. I can't tell you how many times I stepped on those things and hurt my feet. 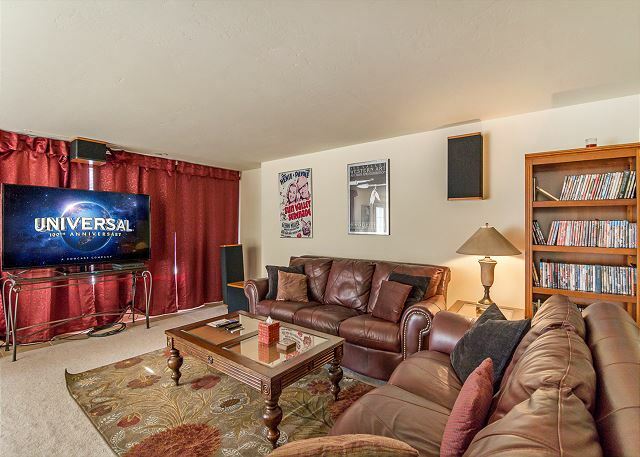 I just think that at this price point, $600/nt, I expect to have cable on all the tvs and be able to use the fireplace, and to walk on the carpet without it being a painful experience. address these issues and I would stay here again. but there were other homes I saw that looked just as nice for less money. this property has huge potential. all things considered, these are minor issues and did not detract from a wonderful experience. We had a wonderful time at Whale Watch Beach for our 30th anniversary. The location is probably the best on the island if you want to tour all over. Very clean and comfortable. Quiet and secluded. The only thing we'd suggest is that the screws in the carpet be removed. We stepped on them several times in bare feet and it's quite dangerous. We were very confused about why they were even there and in such high traffic areas too. It would have been nice to have an umbrella on the deck as well as kayaks, as this is a wonderful spot to launch from. Otherwise, everything was perfect. We had a great time at the Whale Watch Beach Retreat. Great house and location. We saw Orcas, River otters, Harbor seals and Bald Eagles from the deck almost every day. Only nit were the snaps in the carpet throughout the main floor (no idea why they were there and stepping on them was not fun). Wonderful property, would definitely stay there again. My Family celebrated my our 36 wedding anniversary at Whale Watch Retreat - This was a trip of a Lifetime! We watched Orca's and Seals every day, the salmon fishing was great. The best part is the Views from this property.....Magnificent. The house was clean, tastefully furnished and everything we needed. We would love to return in 2016 - I would strongly recommend this property!! This is a fantastic property in a great location. 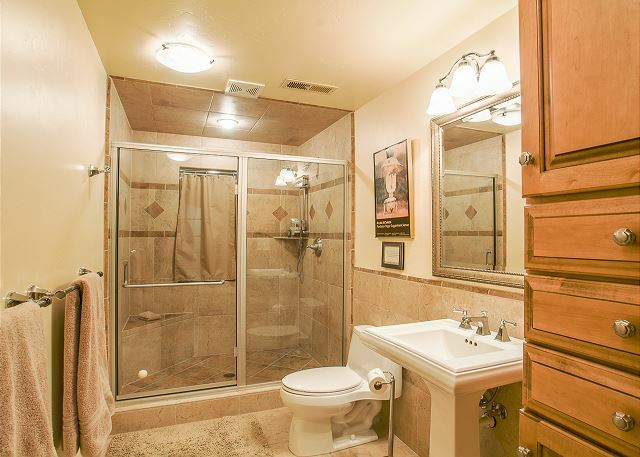 The house was well maintained and had all the necessary amenities you could want. The beds and furniture are in great shape and were very comfortable. We used the spa nightly and it worked great. The neighbors were very friendly and even took my son out fishing and crabbing. The views are out of this world and we saw whales a few times each and every day right from our deck. We saw more whales from our deck than we did from the whale watch boat tour. 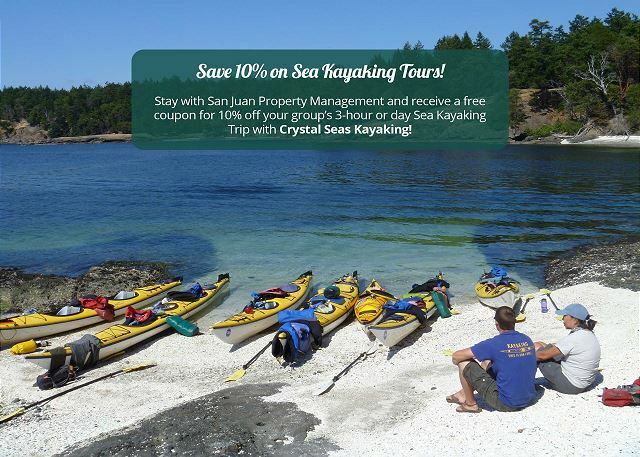 Really enjoyed kayaking with Crystal Seas out of Snug Harbor as the tour goes right by this house and right into the J Pod. I would highly recommend this property and it is well worth the money we spent to rent it for the week. 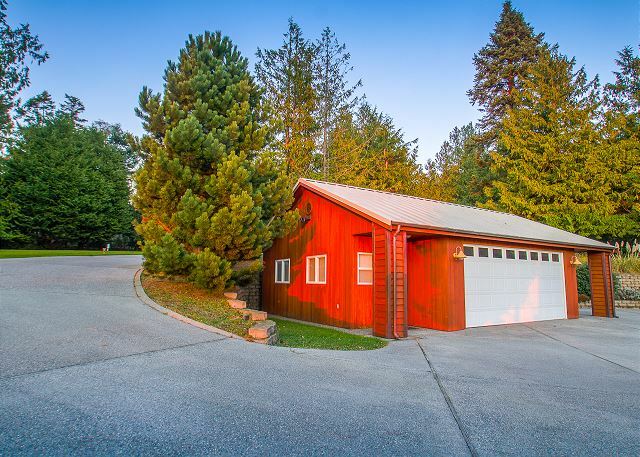 The only drawback was the garage in the picture was locked and not for guest use. I would also like to see satellite TV on the main TV and not just on the lower floor where you spend very little time. The only other recommendation I would suggest is for an 11AM check out instead of the 10AM checkout as 10AM was a tad early. 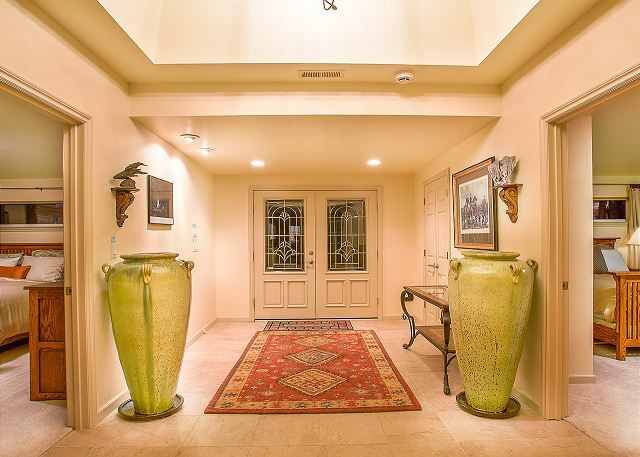 Overall, a great location that is in terrific shape in a wonderful location. Can't go wrong with this home and we can't wait to go back next year to sit in that spa with a glass of wine and watch the whales go by. We were VERY satisfied and would all highly recommend this property. 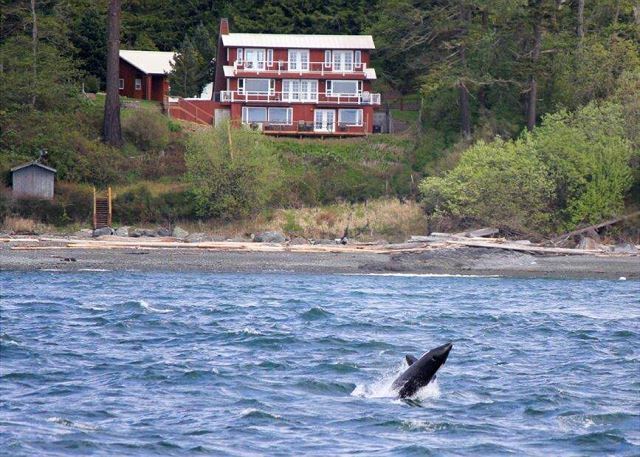 Perfect house w perfect location to see killer whales! Very clean and well stocked!!!!!!! All around perfect! Five brothers from around the country met here for long weekend retreat. This location was just amazing! 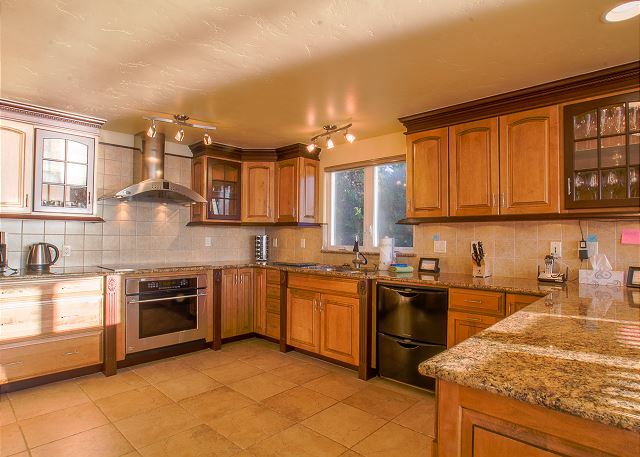 This house was recently refurbished and has wonderful amenities. The house, yard, beach, view, hot tub, decks ect are just like the online pics. We loved it! We would definitely stay here again! This is a wonderful house, well set up for a family group or for couples traveling together. Lots of room for everyone, well appointed kitchen made cooking easy, and the media room on the bottom floor is really impressive. But not as impressive as the view across the straight to Vancouver Island! And we saw lots of sea life - seals, otters, and best of all a pod of Orca whales! 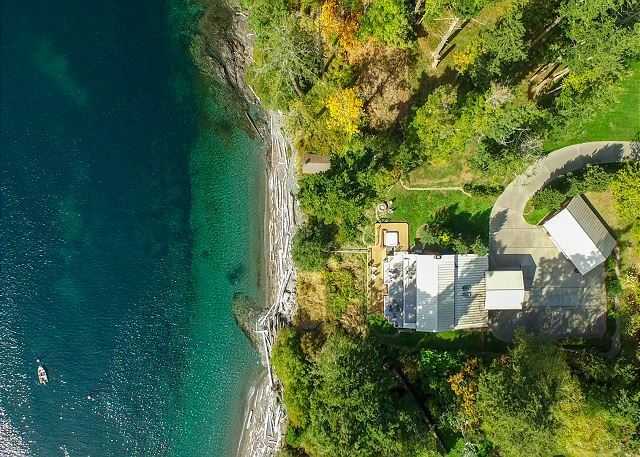 The private beach is accessible by a set of stairs, there is a large grassy area to one side of the house, and sitting in the hot tub on a cool evening is wonderful. This is certainly a place we'll come back to!